I’m Zoey, and I'm blogging here again, of all things. Yes, I'm a dog, but I have opinions just like people do. 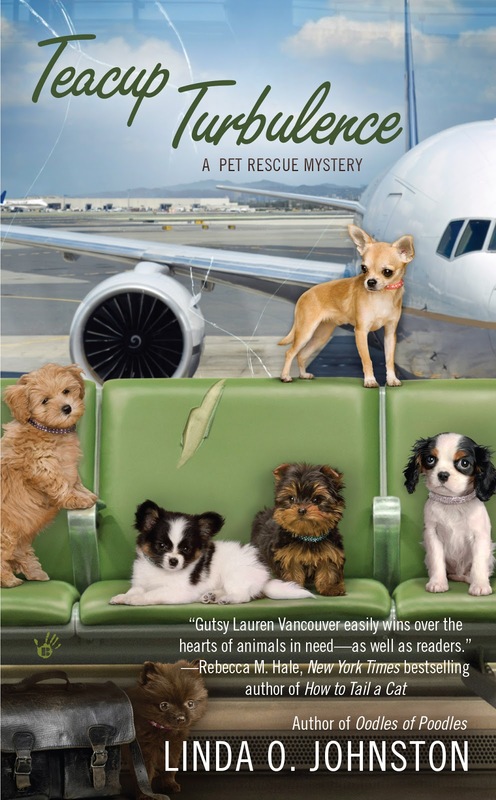 I asked to talk here because I understand that my person, Lauren Vancouver, who stars in the Pet Rescue Mysteries, has another adventure coming in a few months. January, is what I'm told. It's called TEACUP TURBULENCE, and it supposedly features a bunch of dogs who're a whole lot smaller than I am. Now, I know people make a big deal about dogs' backgrounds. I really don't care. But I'm part Border collie and part Australian shepherd, or so I'm told. The dogs in TEACUP TURBULENCE are little guys like Chihuahuas and Yorkshire terriers. The thing about them is that they're rescue dogs, like I was. The ones in that story are mostly from someplace else, supposedly an area farther east in the United States than where I live, in California. The people where they were rescued couldn't find good homes for them, but thanks to some big advertising signs that featured little dogs, lots of people in L.A. wanted to rescue tiny guys like them but there weren't enough around. So what happened? Airplanes! Not that I've ever ridden in one myself, but I've seen plenty when I've been on walks or are otherwise outside in my yard or at HotRescues. They're like big birds, and they make a lot of noise. Sometimes I bark at them. But the really interesting thing about them is that people make them move from one town to another. And they ride inside them. Way up in the air like birds. And the planes in TEACUP TURBULENCE are used to move those little, homeless dogs from the east to L.A. where they can find new people to take care of them and become their families. Good deal. I'm glad I was taken in by Lauren without my having to ride in one of those things, but I'm happy for the dogs who've gotten new lives thanks to getting rides in them. I'll be interested to hear more about those planes in the future. And I'll look forward to January when this new story can be read by people. And know what? I've heard that a person gets murdered in that book. My human Lauren keeps getting involved in situations like that. And I'll always be there to help make her feel better. We don't bark at those big things in the sky, and we don't like anything noisy, except each other, but that's not noise. I've heard about several pilots who bring dogs from areas where they can't get adopted to safe areas where they can find their furever homes! I can't wait to read this story about it! I bark at them because it's fun, Sally-Forth and Tally-Ho, but I respect your right to ignore noisy stuff. You might want to try it sometime, though. Yes, there are really groups that do that, Katreader. I admire them and am glad to let more people know about such great and dedicated rescuers. Nice to meet you, Zoey, you are sweet to care about those other dogs getting homes and taking care of Lauren, your human. You both have pretty names.